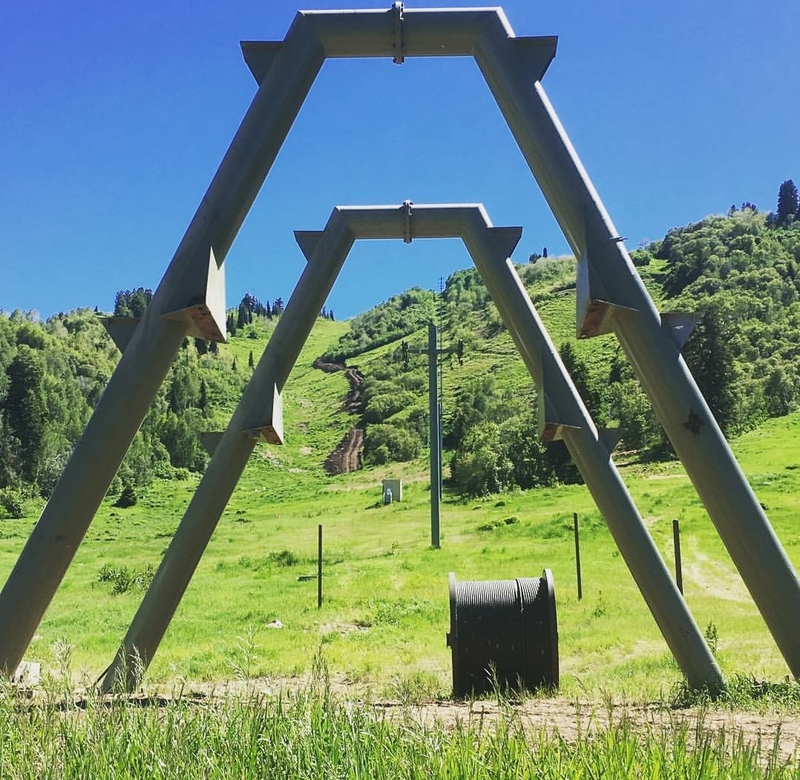 For fifty-one years (1946-1997) the Wildcat Chairlift served as the main street of Snowbasin Resort. 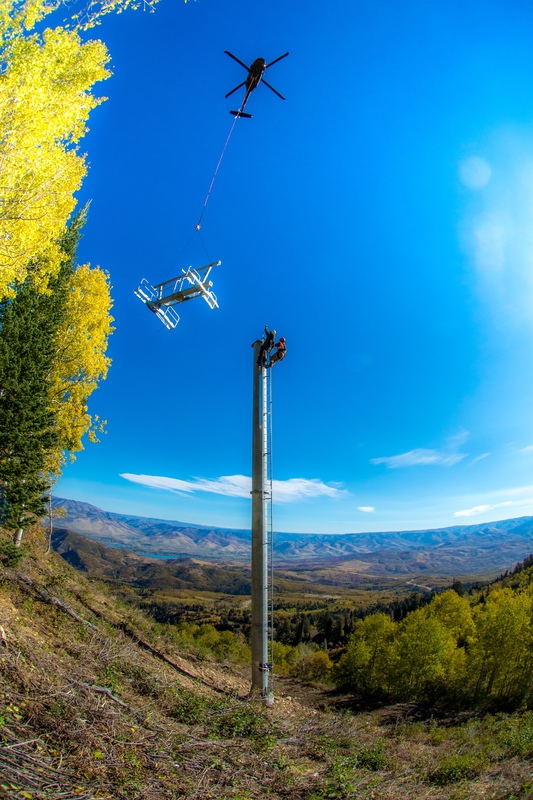 The single chair was the first lift installed on the resort and operated from 1946-1973. The Wildcat double was built in 1964 parallel to the single chair, tripling the uphill mountain capacity and operating next to the single on busy days. In 1973, the Wildcat chair was updated into the fixed-grip triple that lived there until this summer. Now the triple is being updated this summer into a high-speed six-pack. 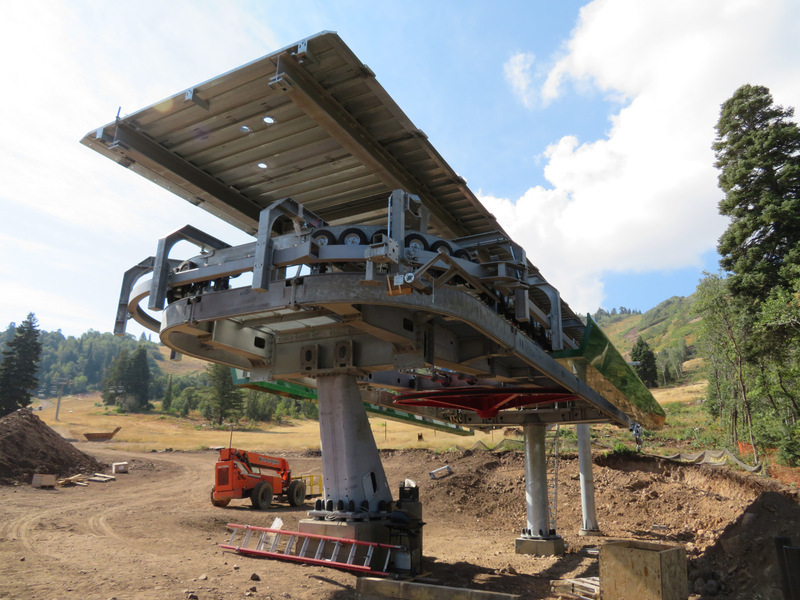 “With the addition of a new Doppelmayr 6 passenger high-speed chairlift, we will be able to better utilize this area of the Resort that was the original heart of the ski area. 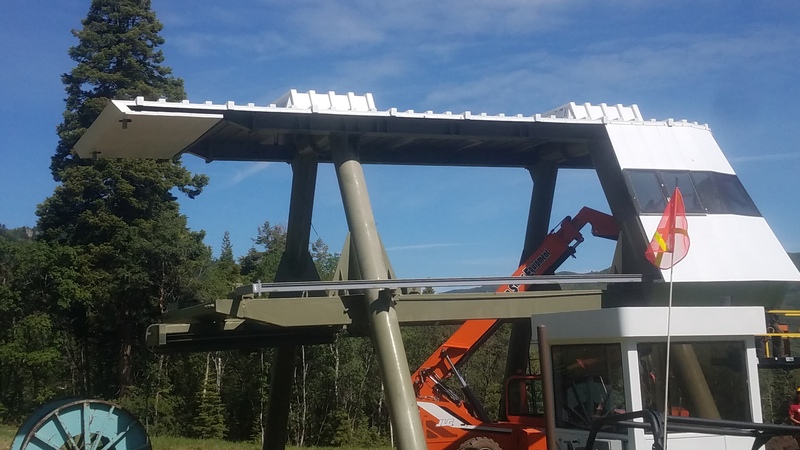 The new lift will service beginner, intermediate and advanced terrain and include new snowmaking on Wildcat Bowl, Blue Grouse, Herberts, Eas-A-Long, Wildcat Traverse and Stein’s. 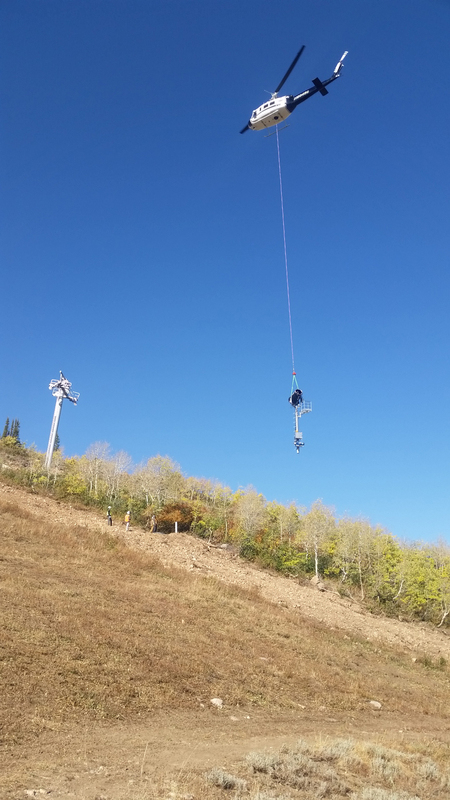 These improvements will improve access to this wonderful terrain with earlier access and better conditions when Mother Nature is not as cooperative as we would like,” states John Loomis, General Manager at Snowbasin Resort. 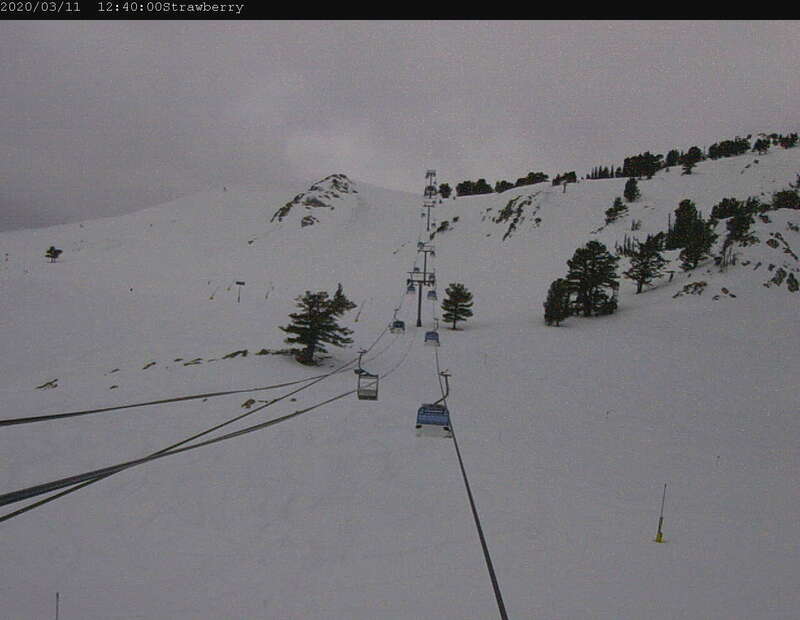 Here we will be sharing photos to update everyone on the construction of the new lift. Dismantling of the lower terminal late this spring. 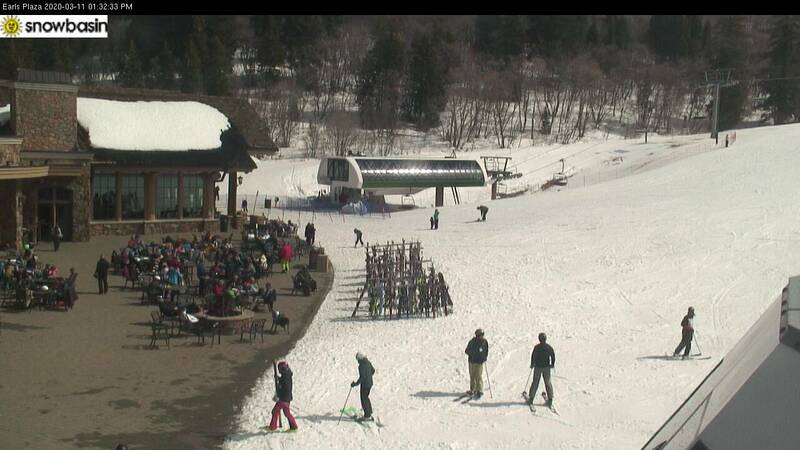 The chairs and cable were removed from the Old Wildcat Chair late this spring. 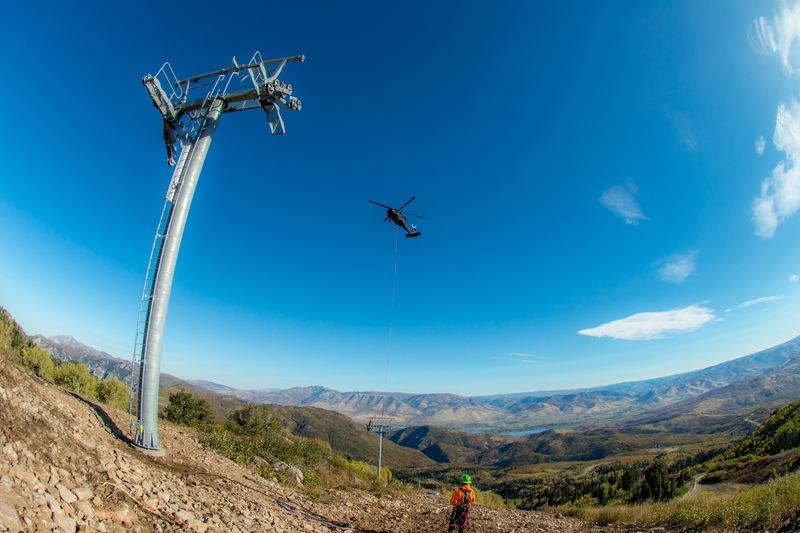 The old towers will be flown off the mountain when the helicopter is here to pour concrete for the new lift. A truckload of parts for the new lift. These parts are the sheaves "the wheels" that are on every tower. 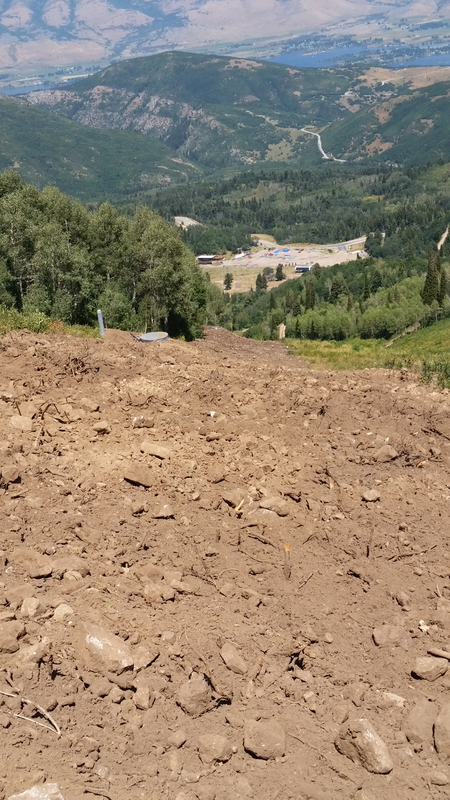 Construction has started at the top of Wildcat on both the removal of the old lift and the snowmaking installation. In this photo, you can see the crane removing the old terminal. 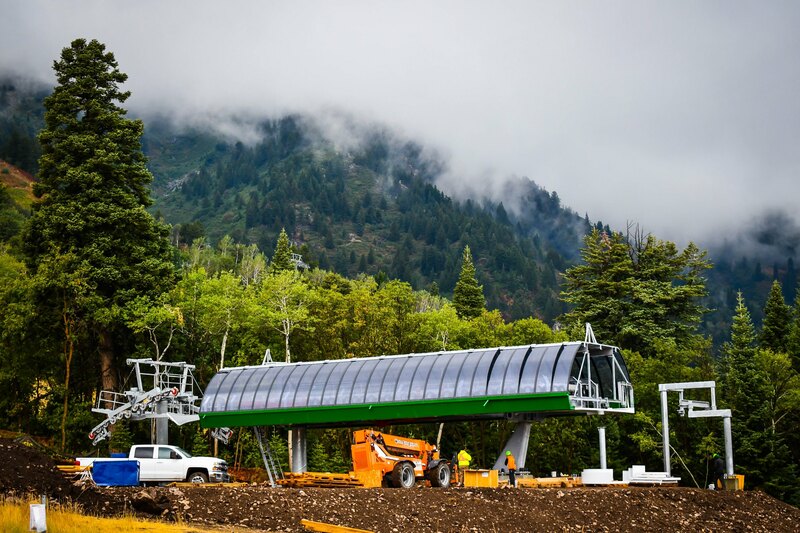 Additionally, the installation has started on the new snowmaking. 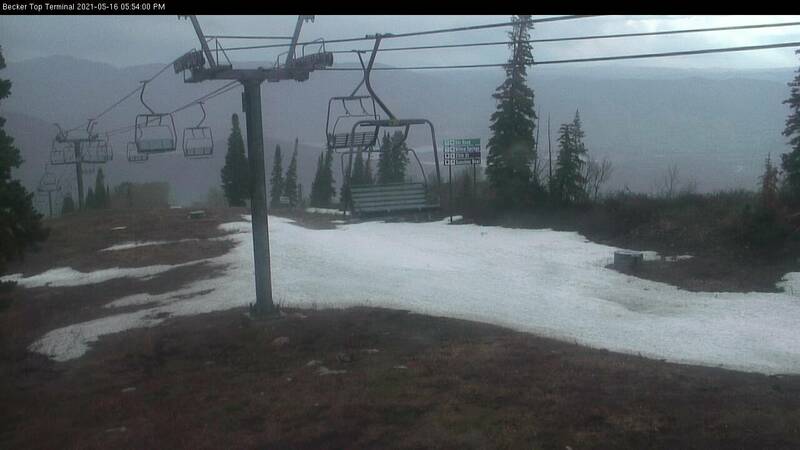 From this location snowmaking will run down Blue Grouse, Herbert's, Eas-a-long, Wildcat Bowl and Wildcat Traverse. 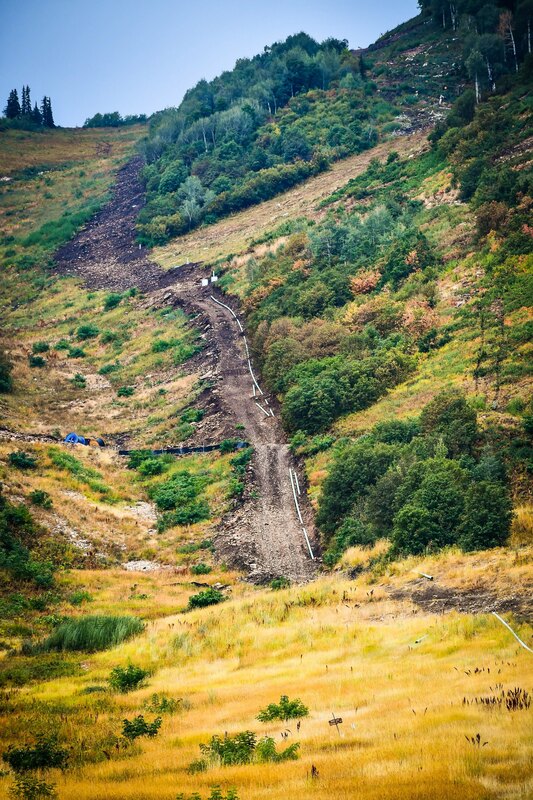 This picture shows the 40' sections of snowmaking pipe being "zaplocked" together. This process is more efficient and safer than welding the pipe. We have taken a delivery of 38 new SMI Super Polecat Fan Guns. Twenty-three of these will be tower mounted and the other fifteen will be carriage mounted that will be capable of moving to several locations. All the inner workings of the bottom terminal. Footings for the bottom terminal have been poured. These will be backfilled to the top of the footing when the lift is complete and almost completely buried underground. Tower foundation concrete forms. 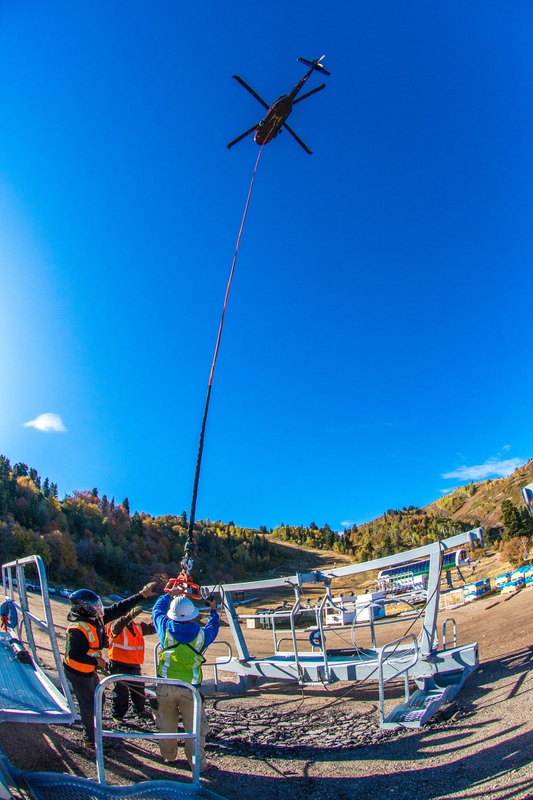 These will be flown to the appropriate locations on the lift line. 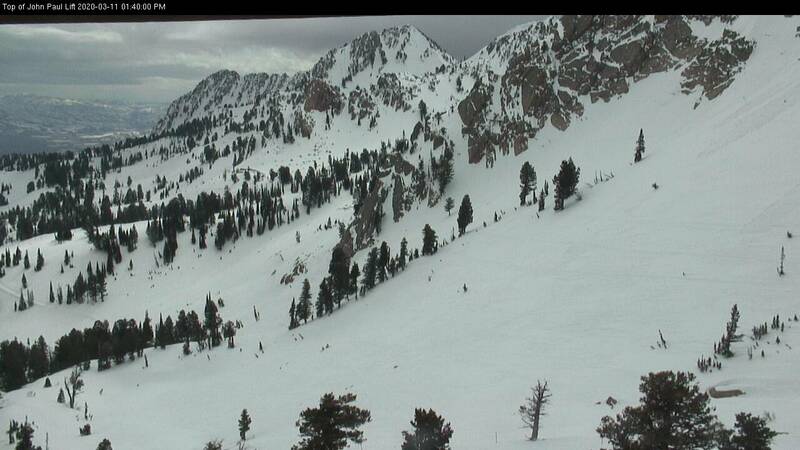 The Webcams highlighting the construction are now live. Click here to see them. 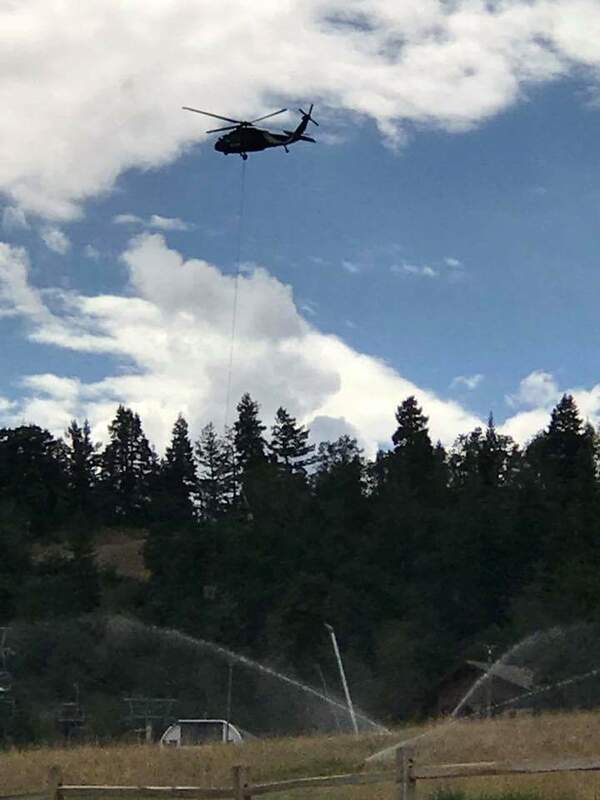 Blackhawk flying the towers for the New Wildcat Lift. 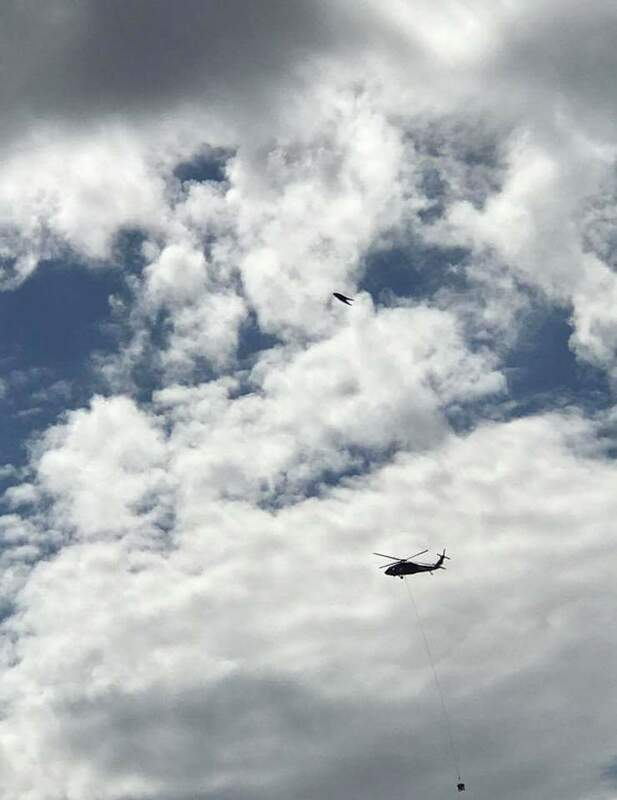 Also head over to our Youtube to check out the video of the helicopter flying in action. 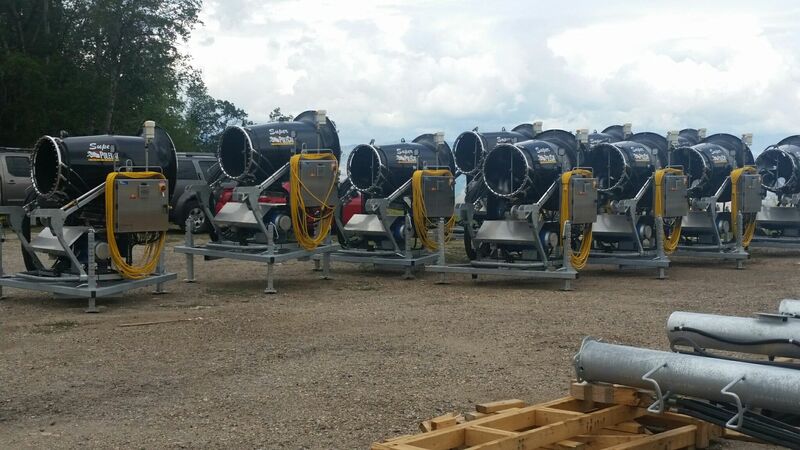 New snow guns ready for placement that are self-contained fan guns that are permanently mounted on towers. 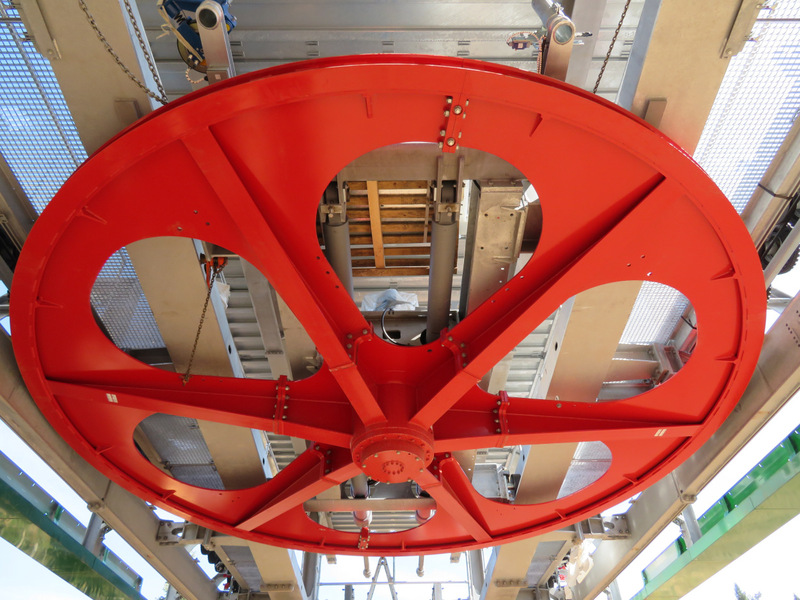 The return terminal is now in place which includes the return bullwheel and tension unit. The tension unit ensures the rope is pulled tight enough to provide the friction necessary to pull loaded chairs up the hill. The exterior of the bottom terminal almost finished. 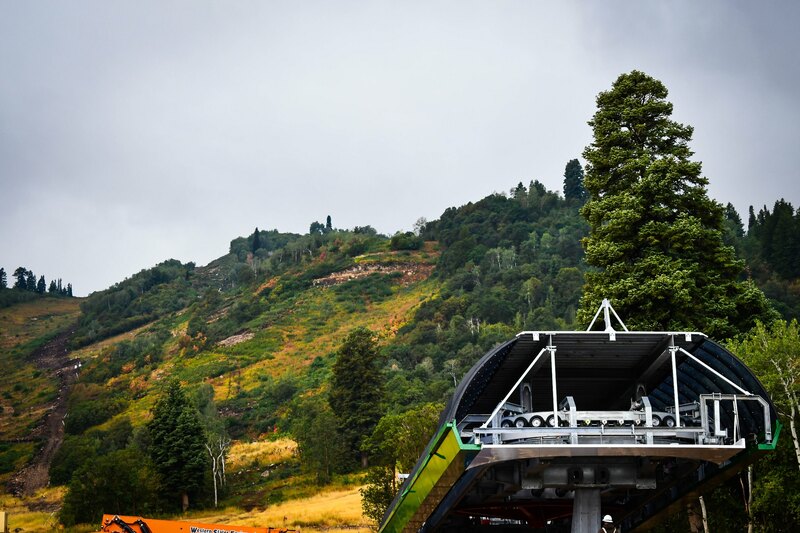 Fun Fact: Wildcat has not been ski lift tower free since 1944. 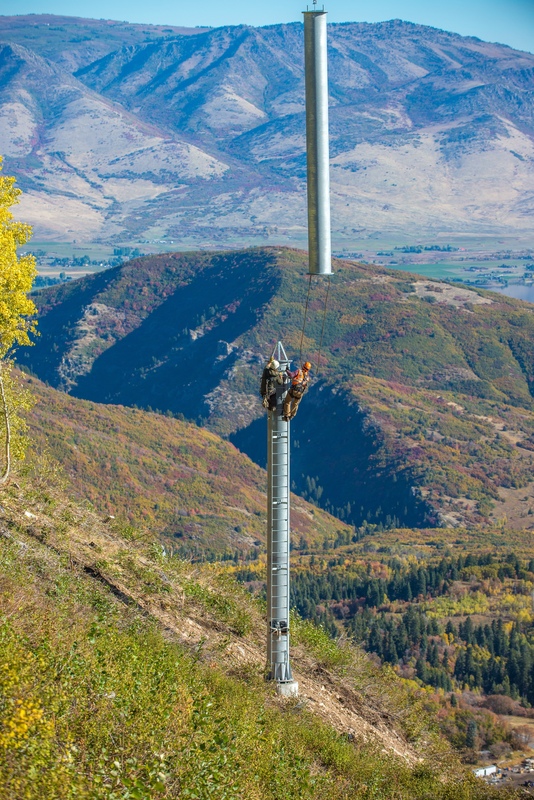 Each new Wildcat installation was constructed next to the old one and the old towers were not removed until after the new lift towers had been installed. 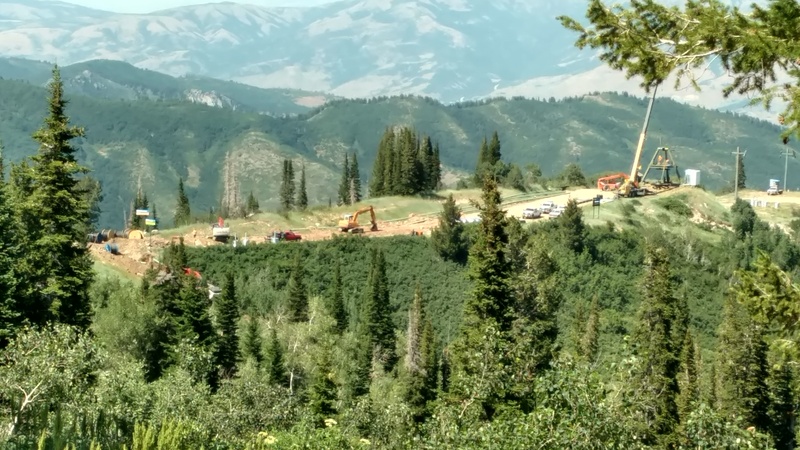 Snowmaking piping being buried and placed on Wildcat Bowl. Wildcat Express Drive Platform at the top of the new Wildcat Express. Fun Fact: The drive platform weights 38,000 lbs. 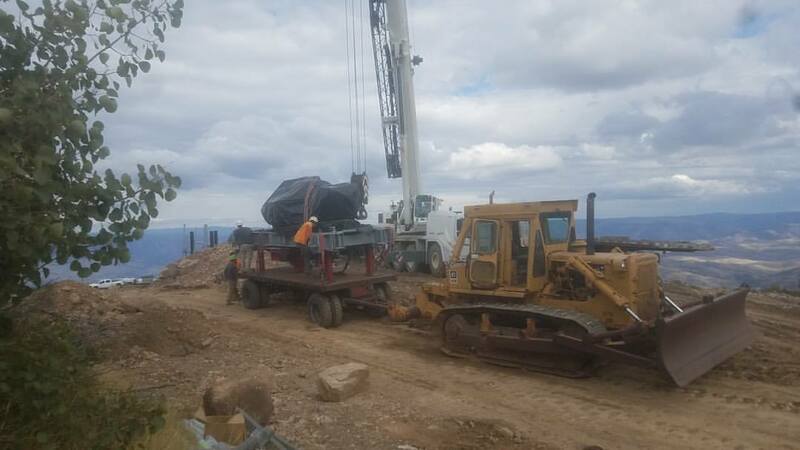 Our dozer hauled it up the mountain. Positioning the lower operating shack of Wildcat Express. 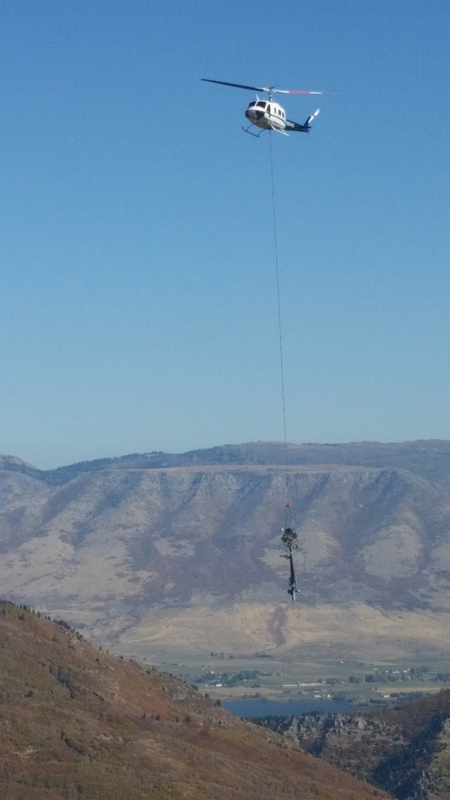 The Blackhawk flying towers for the new Wildcat Express. 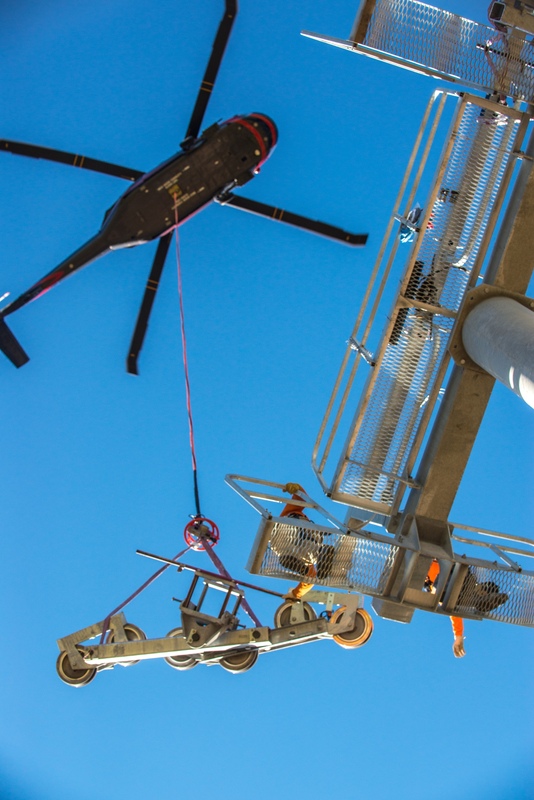 Lift mechanics and the Blackhawk working together to connect the different parts of the tower. Adding the cross arms at the top of the tower. 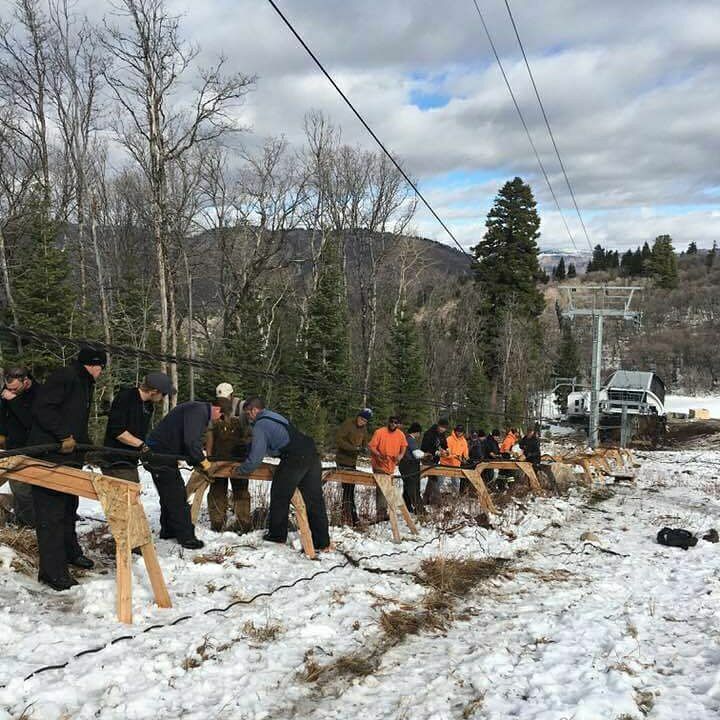 Top of Wildcat getting put together. Loading up in the parking lots with the next piece to fly. A different perspective of the sheaves being placed on the tower. 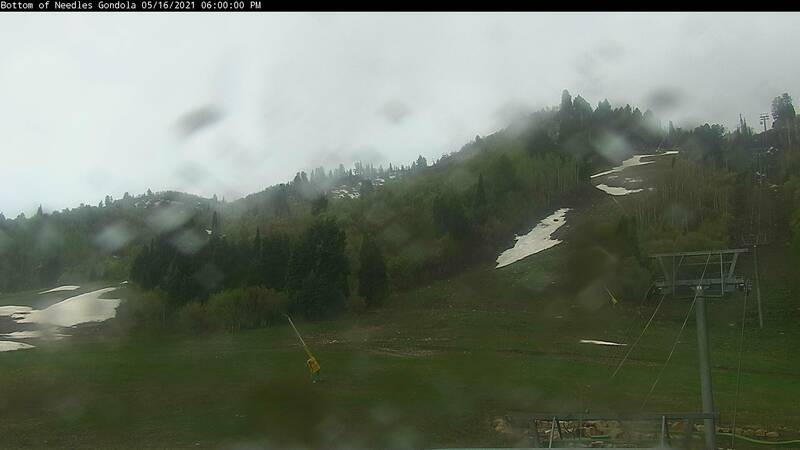 Snow guns and towers being taken up the mountain. 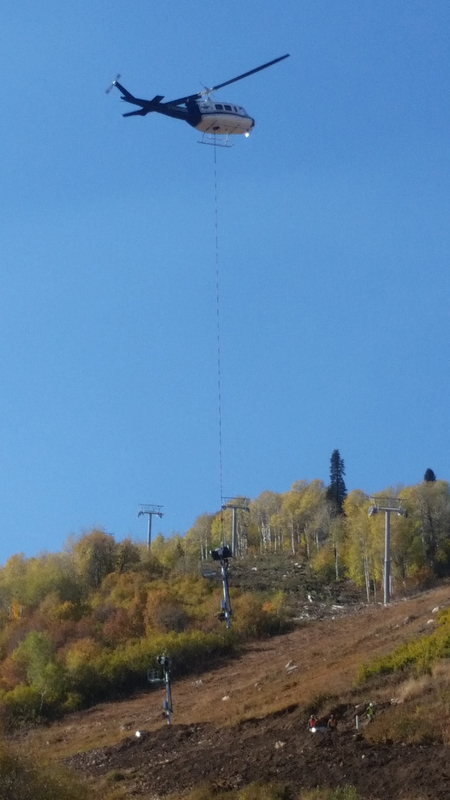 Snow guns and towers being placed on Wildcat Bowl. 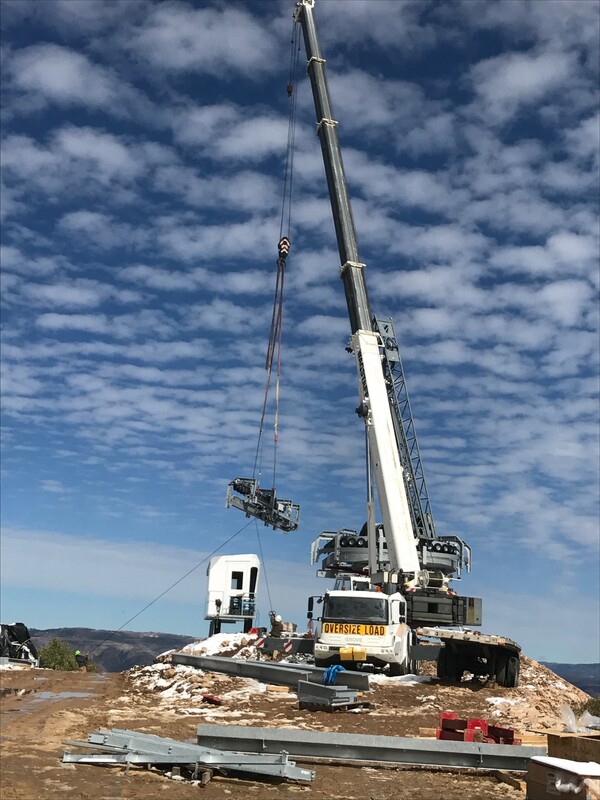 Snow gun and tower being placed on higher part of Wildcat Bowl. The top terminal is now finished and all we have left is to install the Com line and the Haul Rope. Until we get some pictures, here is a description of how we will install both of these important parts. The spool of com-line is taken to the top station. The spool is mounted to a special stand that utilizes a brake to control the speed of the spool as it unwinds. A rope is tied to the free end of the com-line and a group of people pull the com-line downhill using the rope. When they reach a tower someone climbs the tower with the rope attached to them. When they get to the top the rope is thrown down the other side and they continue pulling the com-line downhill. 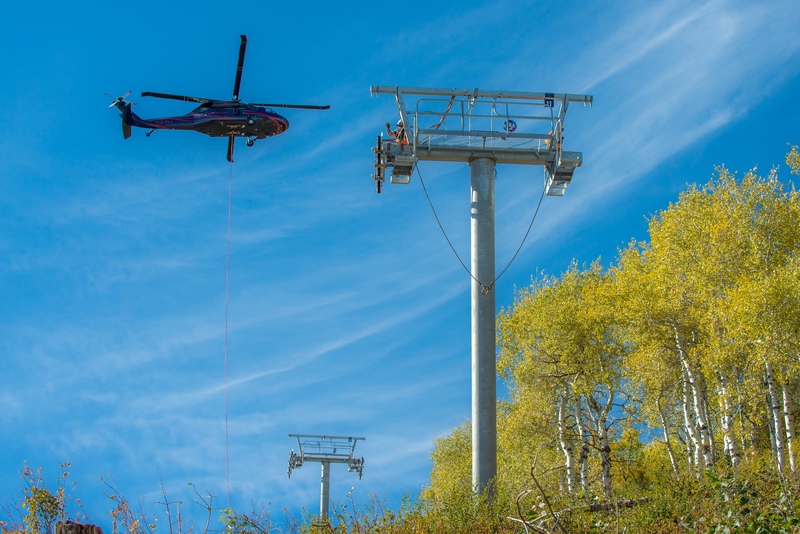 The number of people required to pull the com-line depends on the length and profile of the lift. The haul rope is placed on a special spool stand at the bottom station. A spool of small diameter rope is taken to the top station and mounted to a stand that utilizes a brake to control the speed of the rope as it unwinds. The small rope is pulled down the lift line by hand and placed over the towers. This is done on both sides of the lift. Once the rope is placed on the towers on both sides of the lift it is connected at the top and placed around the top bullwheel. At the bottom, one end of small rope is attached to a large winch while the other end is attached to a larger rope (possibly the haul-rope). As the winch spools in the small rope, the larger rope is pulled behind it around the entire lift. Sometimes the process is repeated depending on the size of the rope and the lift profile. Once the haul rope has been pulled onto the lift; tension is applied to the rope to remove excess slack and the two ends of the rope are spliced together. (The winch and haul-rope are not always placed at the bottom of the lift. They will be placed in the area most suitable to conduct the splice). 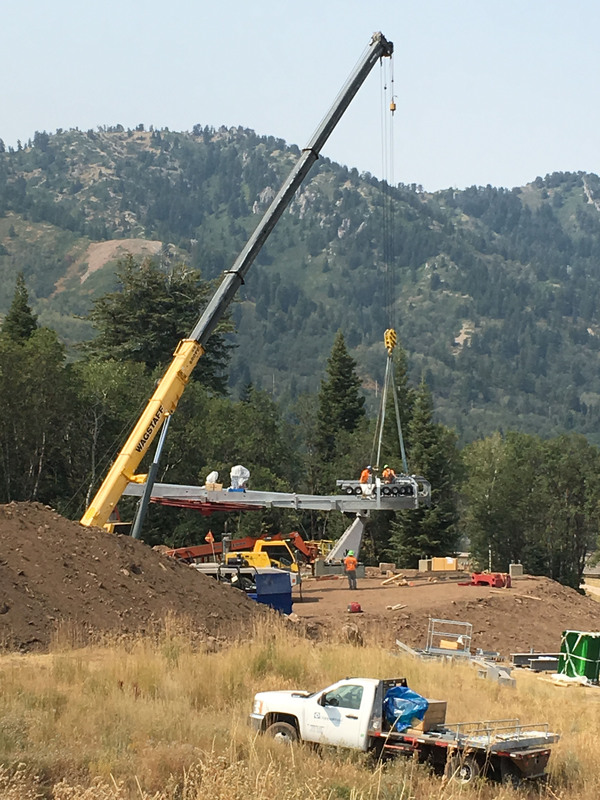 The last bit of construction on Wildcat Express happened yesterday. Our team was busy doing the rope splice with the cables. Now we just have to add the chairs!